IVG-GUARDIAN: a constantly evolving range. The flexible solutions IVG-GUARDIAN® are ideal for the protection of melting processes: reliable guardian for your metallurgical plants. IVG-GUARDIAN® Electro, Arc Save and Induction was designed in IVG by a team of skilled professionals who developed three different solutions to meet the specific needs of industries in the metallurgical sector. Products with different technical characteristics which have overcome strict tests to ensure faultless performances in application where hazardous environments do not admit mistakes. The IVG-GUARDIAN® products are softwall hoses, belonging to the Cable family, used for the protection and cooling of electrical cables in steel mills, foundries and in many industrial sectors where the rubber hose works near heat sources and in particularly harsh working conditions. IVG flexible solutions therefore play a key role for the proper functioning of cable and electric oven and they are resistant to stress, mechanical twisting and vey high thermal gradients. Cable IVG-GUARDIAN® Electro, designed for protection and cooling of electrical cables, is characterized by excellent insulating qualities thanks to an electrical resistance greater than 1x108 Ω/m and breakdown voltage greater than 6kV / mm. The structure is very stable in service thanks to the very low elongation percentage (+ -2%) with hose at working pressure. The cover compound is self-extinguishing in accordance with ASTM C-542 and heat resistant with peaks up to 110 °C. Cable IVG-GUARDIAN® Arc Save, developed on large diameters, is the ideal solution for covering and cooling high-voltage and high section electrical cables. It is used in electric arc furnaces, suitable for U-form applications. It is heat resistant thanks to a flame retardant cover according to ASTM C-542. 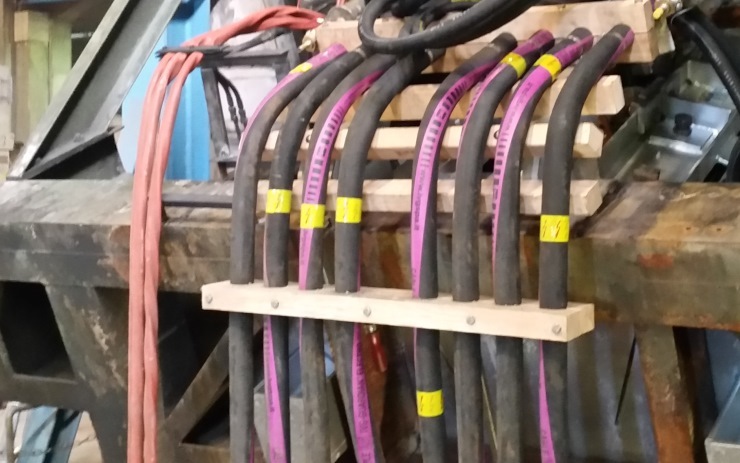 Cable IVG-GUARDIAN® Induction hose completes the range with a structure ideal for small diameters. Used as a flexible connection in the electric induction furnaces to convey cooling fluids. It combines a high degree of insulation (R> 1x1010 Ω/m) to a breakdown voltage > 6000 volts/mm. Request the data sheets of the IVG-GUARDIAN® lines to marketing@ivgspa.it: you can see the wide range of diameters (tolerances according to UNI EN ISO 1307/2006) and the available working pressures.